Hush Kid's First Album is HERE! Friday, October 26th, 2018 Hush Kids released their self-titled debut album featuring 10 new songs. Band members Jill Andrews and Peter Groenwald have worked tirelessly with producer Ian Fitchuk on each and every song and now get to share the masterpiece with the world! Needless to say, I’ve been nothing short of excited for the album release ever since I heard their single “Love is a Made Up Word”. With the steady release of other singles “What’s Your Hurry”, “Morning is Made”, and “Goodbye Rain” over the past few months, we finally get to hear it all. In Nashville and looking for something to do November 15th? Come see the magic in person and grab tickets from the button below for Hush Kids live at The Basement. I’ll be there and so should you. You won’t regret it. Check out the support from Spotify, Amazon and Apple Music in the gallery below! It’s been a long time coming, but the day has finally come. On the morning of Thursday, October 11th, 2018, President Donald Trump was joined by numerous music industry veterans to sign the Music Modernization Act (MMA). This will change how mechanical licensing of songs that are on digital streaming platforms such as Spotify and Apple Music will now be run: entirely by music publishers. It will increase the statutory rates with the help of performance rights organizations such as ASCAP and BMI, meaning more money for our dear music publishers and songwriters, not just the artists and labels. Under the MMA, recordings before the year 1972 will now be able to receive master recording performance royalties. This means all your favorite hits from artists around that time will now properly be paid the way they should’ve always been. The MMA also plans to help create one database where anyone can access records of sound recordings and identify them to their proper songwriters and publishers as conspicuously as possible, as well as match them if they haven’t been already. It doesn’t seem like much, but in this day in age, more people are consuming and streaming music than in the history of mankind. This needed to happen. It’s been years in the making and to have things ultimately moving along is truly rewarding for so many in the industry. Back in the old days—1877 to be exact—the invention of the phonograph truly shook up the music publishing industry. This was a big disrupter to many who made a living off of the royalties earned from the printed song books and sheets. Instead of buying the sheet music to play in their homes, people now got to buy a record player and the vinyl they wanted to hear and have it instantly — no musical knowledge or skill needed! Adapting to the times, eventually music publishers found themselves getting back on their feet and suiting themselves fine off of vinyl sales and the mechanical royalties they curated. Whew. Taking a step into modern times, things in the music industry have done another earth-shattering thing…Streaming. Dun dun dunnnn. In 2013, the technological world was introduced to platforms that allowed people anywhere and everywhere access to all of their favorite tunes without actually buying them. Basically, platforms like Apple Music and Spotify are more so digital lockers: they can hold all of your favorite songs, allowing you access to them at any point. There you can pick and choose specific songs and stream them instantaneously. What does this mean for the music industry, specifically music publishers and writers? It means very little money coming in the form of mechanical royalties (monies paid through streams). Recently, however, there has been an increase in vinyl sales despite what’s been happening online! Millennial’s and generations of the like have resorted back to the more “aesthetically pleasing” format of listening to records. Yay! In 2016, vinyl sales reached a 25-year high, raising by 53% (Ellis-Peterson, 2017). For my music publishers out there, this isn’t too shabby. 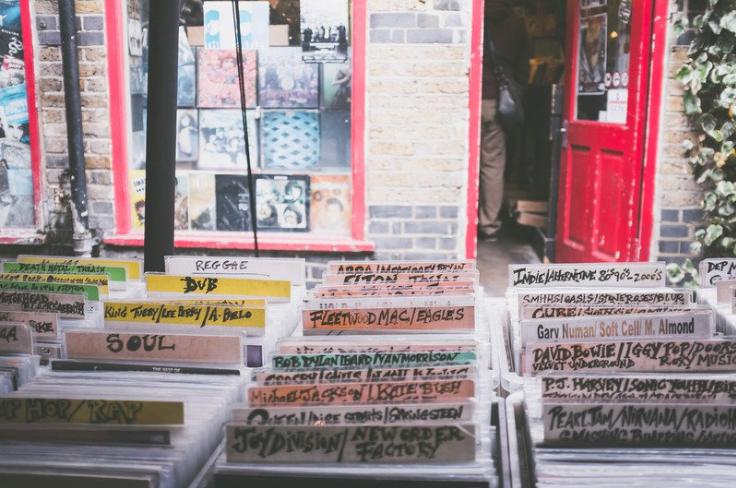 Returning to this tangible music has been good on every front: mechanical monies are coming in heavier, brick and mortar record stores have greater profits, and consumers get to enjoy the music in the best way, second to live performance. There’s something fun and exciting about going to a second-hand record store and rediscovering the music that influenced the songs we hear today. Go grab a friend or neighbor and scavenge for a new or already-loved LP. Sit down and listen to the music that makes the world (and turn table) go ‘round! Click below to order/preorder vinyls from Lydia Luce, Matthew Perryman Jones, and Hush Kids! "The Waking Hours" is OUT! What a perfect description and depiction of MPJ’s new album. I don’t know about you but, I’m ready to see him perform this album live. Get ready to have a good cry listening to Matthew’s voice sing these delicate tunes. Check this link https://www.mpjmusic.com/tour/ (or at the bottom) to get your tickets today!!! It’s also available on all streaming platforms here if you aren’t a huge fan of crying in public. Hope you enjoy this album as much as I do! This video was shot in an old Volkswagen Van on the west coast of California with the Westy Sessions. Perfect, right? I don't ever get tired of this song, and you neither will you. Needless to say this is my absolute favorite. Written for Lydia's older brother and his bride as a wedding gift, this song captures every essence of love anyone could ask for. Simply put, you can't find this gift on any ordinary wedding registry. Here we are able to see just a portion on the amount of talent Miss Lydia Luce has. Here she is accompanied by the harmonies of Zach Torres, along with her enchanting viola in another Westy Sessions. As the month of August comes to a close, I wanted to share a playlist of mine. It includes all the songs I have discovered and rediscovered over the course of the past 31 days. I do this every month in hopes that I can make a "Greatest Hits of 2018" playlist at the end of the year. I rediscovered music by the actor, Michael Cera. I bought the album when it first came out in 2014 and then it was recommended to me again on Spotify. This month I have gotten into K-Pop, which stands for Korean Pop music. A lot of my friends have told me about it for awhile and it finally stuck! I am looking forward to listening to more international music in the future. My family and I are also big Avett Brothers fans, so when I saw that Jill Andrews and Seth Avett sang together I was very excited. Both of them have beautiful voices and they blend together so well. The Streaming World Changing One 'Alexa' at a Time. Alexa, the world renown smart speaker is changing the way consumers consume music. Studies show that in January of 2018, over 39 million Americans, 16%, owned a smart speaker. Have you ever gotten home after a long day and said, "Alexa, play me something relaxing," or if you're making dinner, "Alexa, play me a dinner playlist". Before smart speakers came out, it wasn't likely that people would search for music by what activity they were doing. That is why metadata is so important in this day in age. Labels will now 'classify' / categorize their music under moods and activities. They essentially add 'tags' (metadata) to their songs to describe them. So, streaming algorithms incorporate that data to get on to a curated playlist made for your mood. Streaming services have codes/algorithms to have curated playlists ready at the sound of the consumers voice, crazy right? Not only is this beneficial to the consumer but, artists get more exposure than they would have before streaming. Smart speakers make it easier to find new music which brings up artists numbers as well. As complex as 'Alexa' might be, smart speakers are taking over and revolutionizing the world of streaming. So next time when you get home from a long day and want something relaxing ask, "Alexa play me Lydia Luce's new album Azalea". You always hope for interns with similar music taste, but sometimes that's just not in the cards. You may have to sacrifice the simple comforts of mutual interest sometimes when hiring interns. Thankfully that's not the case with Kaley! During our interview we bonded over concerts we'd been to and albums we were digging, and that's pretty refreshing. Beyond that, Kaley's got some awesome experience as a PD at a student-run radio station in her hometown, and has a great attitude about accomplishing anything you might need her to. She's a smart cookie and a good hang, and we're eager to help her achieve whatever she wants to achieve with us this semester! Also, thank you, Kaley, for introducing us to Pepperoni Cheese Bread in your below blog with accompanying pictures. My name is Kaley Ross and I am interning at Olivia Management to gain as much experience as I can about management, promotion, and running a business! I am also looking forward to making connections with people in this field with similar interests, like music supervision and going to live shows. Definitely Pepperoni Cheese Bread. If I'm not paying attention I can eat an entire box by myself. My favorite part about Nashville is Woodland Street because it has my three favorite places to go, which are Five Points Pizza, The Soda Parlor, and High Garden Tea and Apothecary. I for sure want to be the old lady down the street that the local kids think is a witch, but professionally, I would love to be either an Artist Manager or a Music Supervisor. I have not decided yet. I chose to intern with Olive Management when I had Erin Anderson as my Entrepreneurship Professor. She is such a genuine person and I have always been interested in Artist Management. This seemed like the perfect learning opportunity for me and I cannot wait to get started! Mackenzie is a rare find of an intern. When I was interviewing for the semester, I'd already hired three interns by the time interviewed her, and wasn't planning on hiring a fourth. However, a previous intern, Callie Paige, told me that I'd love her and that I'd 100% end up hiring her. She was right! 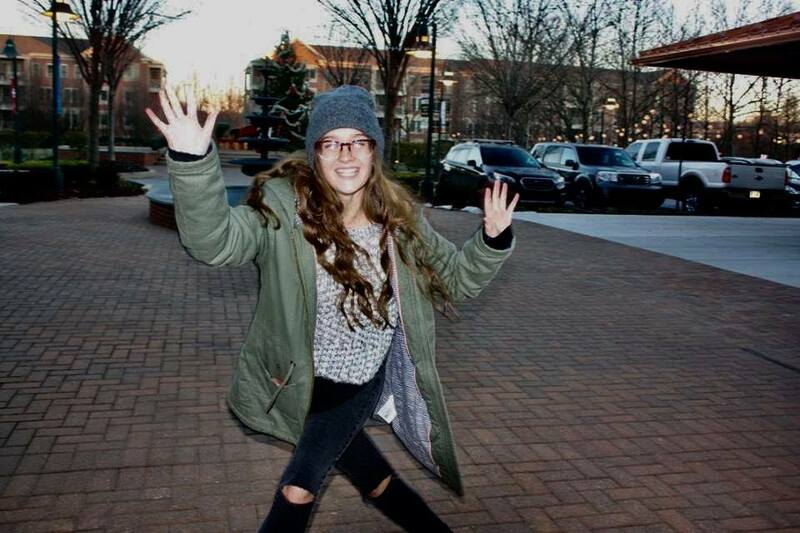 Mackenzie is just a Sophomore, but when I chatted with her for the first time she was the type of person that seemed like she had wisdom beyond her years and a poise that most students her age don't have. I'm so glad I hired her on with us because she's already proved that she's invested and eager to learn the ins and outs of the industry, as well as our company. LOOK OUT for this one, y'all! You're probably going to hear her name in the future! I want to learn as much as I possibly can. There's only so much a classroom setting can teach you. I want to be able to take what I've learned so far, and further that with hands-on experience is truly something I'm so excited for and I know I'll get here at Olivia Management. I really love exploring new places, writing my own music, hanging with my sweet pals, and playing with my puppy Sophie when I'm home. Easy: Ice cream. What mood, occasion, or lazy afternoon has ice cream ever been unnecessary? About two years ago, my dad and I took the hour drive up to Milwaukee, WI from Chicago and settled in to hear Foy Vance live in concert. This show was at Collectivo Coffee. You'd think it was just a typical hipster coffee shop, but for shows like his, they move a wall separating the coffee shop revealing a huge back room with a stage in the back. The crowd was small, and the show intimate. To see one of my favorite artists play a live, acoustic, and up-close set was so incredible. I chose to intern here because I am in awe of the female powerhouse this company is. From the moment I found out about Olivia Management, I knew I wanted to work here one day. As I learn more and more about the company, the more I like it. I'm truly honored to be interning here. I know they have so much to offer in teaching me, are incredibly intentional with their time and mine, and have shown that they want to get to know me and what I want to get out of being here. I'd have to say my favorite part is my home away from my actual home, Belmont University. There I have found communities unlike anywhere else. I'm from Chicago and had never moved a day in my life. Coming down to Nashville for school and spending a majority of my year here was something I didn't think I could do. Thanks to Belmont, I know I have found a place that I know I can call my own. Am I too late to say princess? In all seriousness though, I haven't the slightest idea. I do know that I love music and everything having to do with it. Music business is just the tree trunk of all the different branches and fields to go down. I'm really loving Lilly's photo below...just so everyone knows. Lilly is our creative design gal on the team this semester, and we've already loaded her up with projects involving ad creative, Pledge-exclusive video content and other less-creative tasks like updating our press spreadsheets that might be less fun but she completes flawlessly! She's KILLED IT on everything we've thrown at her so far with minimal direction needed, and we just can't to see what more she's capable of throughout this season. Check out her eclectic music taste (any Mamma Mia 2 fans in the house?) and more tidbits about her below We're so lucky to have her! I'm excited to get out-of-class experience and to have a better understanding of the music industry and how it all comes together. By the end of this internship I hope to gain knowledge that will help me later down the road and create some awesome relationships. I love being outside whether that's at the beach or in the mountains. I also enjoy reading, going to the movies and listening to music. My grandma's home made chex mix or peanut m&m's. I enjoy all types of music but some of my current favorite artists are Tom Misch, Daniel Caesar, and the Mamma Mia 2 soundtrack, if you haven't seen it yet, 10/10 would recommend. I got to see Daniel Caesar at Bonnaroo this past summer and it definitely had to be one of my favorite live shows. I chose to intern at Olivia Management because I admire their hard work and goals in the industry. They strive for excellence and that is definitely a motto I want to live by especially in the working world. The coffee and the people! These are some of my favorite coffee shops in Nashville! My favorite, 'The Jam Coffeehouse' isn't listed but it's definitely in my top 10! A dream job of mine would be a tour videographer. I would be able to mix two of my favorite things into one; traveling and music. Sometimes you can tell right off the bat whether a student is going to be a great fit for an internship. When Sarah went above and beyond while completing an activity that's part of our interview process, I knew right away that I wanted her to be with us for the fall semester. Having taken a class with Erin, Sarah knew all about our philosophy of excellence and was inspired by Erin's knowledge of the industry to come be a part of our team. We're so happy to have her with us! Learn more about her below. My hope for this internship is to discover if I have what it takes to be a manager. A few people close to me have encouraged me to look into it as a possible career path, so here I am! Specifically, I'm hoping to learn as much about marketing and tour management as I can. I love going to the movies (bonus points to any theater that lets you put your own butter on the popcorn). I also enjoy listening to new music obsessively. I'll listen to a song on repeat for days at a time, seriously. Days. It drives anyone who gets in the car with me crazy. If it wasn't unbelievably unhealthy and super specific, I would happily eat egg everything bagels from the shop near my parents house for the rest of my life. I went to Govenors Ball this summer and got to see Post Malone perform Better Now. There were thousands of people in the crowd, most under the influence of something, and we all managed to jump up and land on the beat at the beginning of the chorus every single time. It was an energy unlike anything I've ever felt before and something I'll hold onto forever. My favorite artists range from Dermot Kennedy to The Weeknd to Denzel Curry to Meatloaf. I will listen to just about anything. I chose to intern with Olivia Management because I took Erin's Entrepreneurship class at Belmont University about two years ago and thought she was really inspiring. She's an unbelievable wealth of information as well as being kind and nurturing so I knew this would be a great environment to learn and grow in. I love how different Nashville is from where I grew up. I'm from Long Island, New York which is a mix of New York City attitude and beach vibes, so coming to Nashville has pushed me to grow and learn about different lifestyles that I would have never been exposed to otherwise. I would like to work at a record label, either in their A&R department or Touring department. But mostly, as cheesey as it sounds, I just want to end up with a career and a life that makes me happy. We're so proud and thrilled to announce that Maggie Adams has been promoted to manager, signing Lydia Luce to the Olivia Management roster! Lydia is a classically trained violist, a hustling musician, a talented writer and has one of the kindest souls. She's releasing her album Azalea on September 21st with a release show in Nashville at the Analog on September 29th. 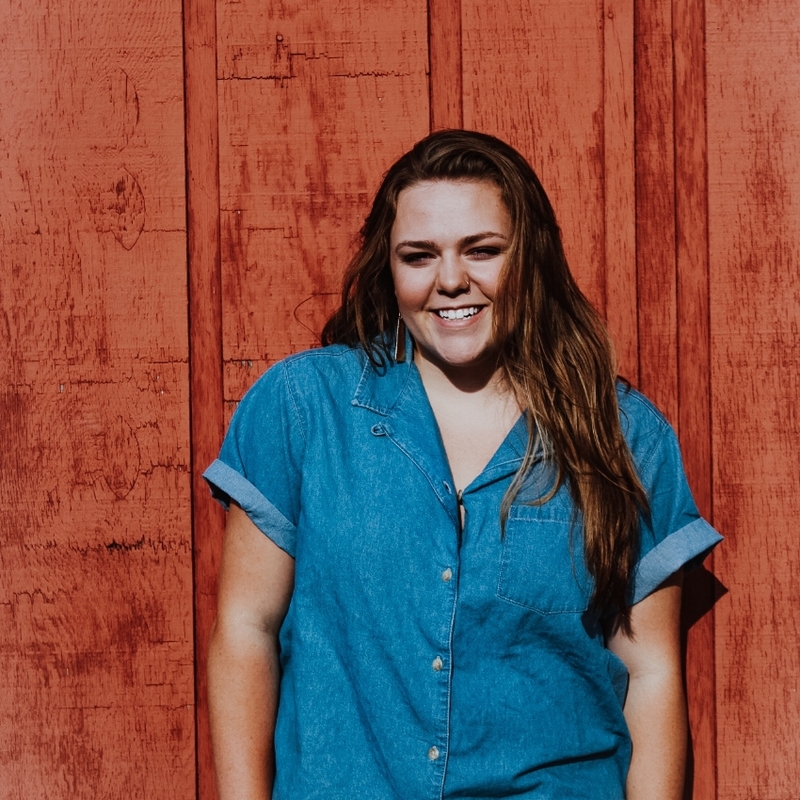 We're so happy to have Lydia Luce as a part of the Olivia Management fam! If you haven't heard, YouTube is in Nashville this week at the Starstruck offices! We went to the happy hour hangs on Tuesday night, and went to the workshop on Channel Optimization today. For #WisdomWednesday we wanted to share 5 easy takeaways from the workshop that you can do now to start optimizing your channel and connecting with your audience. From my experience optimizing channels, and per the support team at YouTube, playlist curation is one of the easiest ways you can quickly make your channel look more professional. In the Creator Studio, you're able to pick and choose what playlists are featured on your home page, so that you control what fans see first and what's served up to them. Create a playlist for interviews and add in videos from other channels, create a playlist for songs you've covered or create a playlist for all your live videos and add in fan's videos as well! This is a great way to pull in videos outside your channel, help fans easily choose which type of videos they want to see and to control which video is served to your fans next. Another easy way to make your channel look professional is to create banner art that's on brand, as well as a profile photo. Your channel banner can promote your tour, a record you're releasing or suggest which video your fans should watch. Create your image in whatever photo program you want, make sure it's around 2560 x 1440 pixels and upload it to your channel to start promoting whatever it is you want to promote! The ideal posting schedule is once every two weeks. Oftentimes as an artist, you won't be releasing music with that frequency, so this is an area where you'll have to get creative. Figure out what works for your brand and for you as a human! Do you love going on long tirades about different types of dogs you love? Great! Release that once a month as one type of series. Do covers perform well on your page? Perfect! Release one cover video a month. Do you have an important release coming up in the future? Wild! Release a short teaser video to entice fans. One valuable thing I didn't realize is that in your YouTube video titles, the first phrase or word in your title should be the most searchable. For instance, Jill Andrew's song "Tell That Devil" is the theme song for the Syfy TV show Wynona Earp, and her video is titled "Wynonna Earp Theme Song Syfy 'Tell That Devil' by Jill Andrews" so that fans of the show can easily search and find her video for the song. Analytics are helpful no matter the platform, and YouTube is no different. In your creator studio, you can poke around in the traffic sources section to figure out how fans are finding your videos, so you can strategize about what content is working and how best to optimize your videos based on that info. This summer I made the trip from the University of Georgia in Athens, Georgia to Nashville for an internship at Olivia Management. 11 weeks flew by way too fast and I wish I had more time, but I am so happy to have had this experience and I learned so much. Now that I've settled back in and am getting ready to start my last year of school, I've had time to reflect on my time at Olivia Management and what I've learned this summer. I've always been the kind of person who goes after what they want and works hard to make it happen. I knew I wanted to intern in the artist management field and I knew I wanted to go to Nashville. After interviewing with Maggie for the position, I knew that this was a place I could see myself working. I loved the idea of working for a smaller company rather than a large corporation and Erin's story was inspiring to me and I knew I wanted to learn from her. It was a little scary to think about moving to another state where I didn't know nearly anyone, but I had a good feeling about it, so I went for it. I took a second job for the days I wasn't interning in order to offset costs. It was a lot of work, but it eventually paid off! My favorite thing about working at Olivia Management was all the hands-on opportunities interns have. I have heard so many stories about friends who have interned with companies who spent their days only on coffee runs and watering plants in the office. I was so grateful to get to contribute valuable work everyday and be involved in projects. I loved the weekly staff meetings on Mondays because Erin always updated us on what the artists were working on this week and what their goals were. Questions and thoughts were always welcome and she would explain why some things are done a certain way. While Maggie, Erin, and Madeline were always willing to answer questions, we were given lots of independence with our tasks. This was beneficial because not only were we trusted with our work, but we were also able to figure things out for ourselves and learn more in the process. I learned a lot about all the systems we used such as Bandsintown, Songkick, Artist Growth, MailChimp, etc. and they are all things I would use in the future. 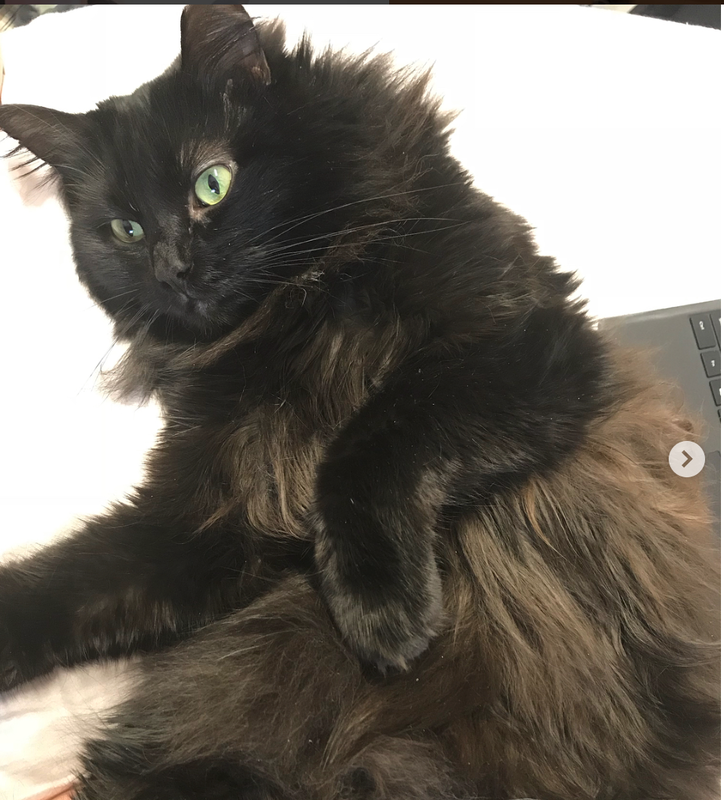 We were given a lot of freedom with our blog-writing which was something I sometimes struggled with, but when I would finally come up with an idea and get it written down and posted, it was a good feeling! Erin, Maggie, and Madeline are three of the hardest working people I know. They are extremely passionate about their artists and dedicate themselves to making their careers as successful as possible. It was really cool to see all the big and small victories that happened every day that make everyone's hard work worthwhile. Whether it's a successful first single release, getting a song placed on a big Spotify playlist, a Grammy nomination, or a sold out show, these victories were exciting to see and reminded me why I want to work in the music business. One of the coolest things I got to do this summer was go backstage for my first time at the Ryman and see The Secret Sisters perform to a standing ovation. So many people came to the merch table afterwards saying how much they loved their performance. This is something any artist's management team would be proud to be a part of! Overall, this summer has been a great learning experience and I'm glad I took the chance to spend my summer here in Nashville. Erin, Maggie, and Madeline have been great mentors and have each taught me so much! This internship has made me fall in love with artist management even more and I can't wait to see where my career takes me next (hopefully back to Nashville in a year!). I've learned valuable lessons and skills that will help me in any area of music or business! I highly recommend an internship with Olivia Management to anyone looking to learn more about the music business. I may be biased, but I think they are some of the best at what they do! I will always be a fan of Olivia Management and their artists and am so grateful to them for giving me this opportunity! 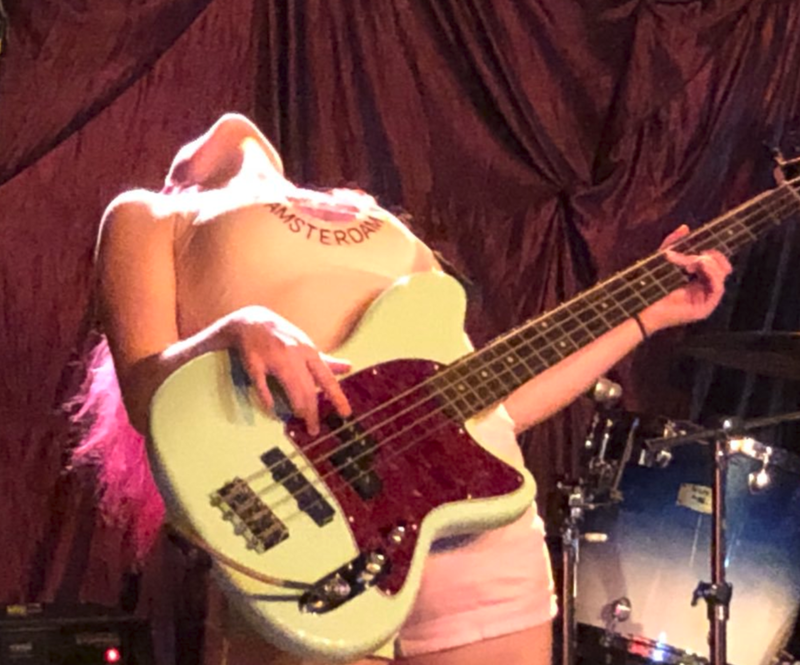 Our CEO and Founder, Erin Anderson, was interviewed for the Music Biz Besties blog about tips for DIY artists! If you aren't hip to them yet, Music Biz Besties is a membership community for female musicians & industry professionals. They've recently brought back their blog series Bestie Chats, and Erin had a short conversation with them that might be interesting to you if you want some pointers on growing your career as an artist and eventually making a living off your craft. Click the button below for Erin's chat with Music Biz Besties! This comes at a timely moment for us because we've just decided to start a bit of a series ourselves over here at Olivia Management. Every Wednesday, we'll be sharing some #WednesdayWisdom from different people in the industry - promoters, radio DJs, agents, friends and artists alike - because it's important for us to highlight the community here in Nashville and the awesome work that our friends are doing. Make sure to follow our Instagram page, so that you can catch our first #WednesdayWisdom post tomorrow! Hi friends! It's Lea here, back with another mini equality rant for your reading pleasure (hopefully). If you didn't read my last post on Females and Festivals, go check it out for some background information before you read this one! Despite the fact that some of the biggest mainstream artists- Adele, Taylor Swift, Beyonce, etc. - are women, festivals all over the world continue to overload their lineups with male dominated acts. More often than not, when you look at a festival lineup it will take some time for a woman's name to appear. For example, here is Lollapalooza's 2018 Lineup, which doesn't have a female artist until the fourth line! It's 2018 and equality has come a long way, but we have got some work to do. Talent is talent and deserves recognition regardless of gender, race, sexuality etc. Slowly, but surely we are making a difference. An awesome festival that kicks off 2019 is Brandi Carlile's, Girls Just Wanna Weekend in Mexico. It has an entirely female lineup including the lovely Secret Sisters! Here's an awesome quote from Brandi with a rundown of some goals for this event. 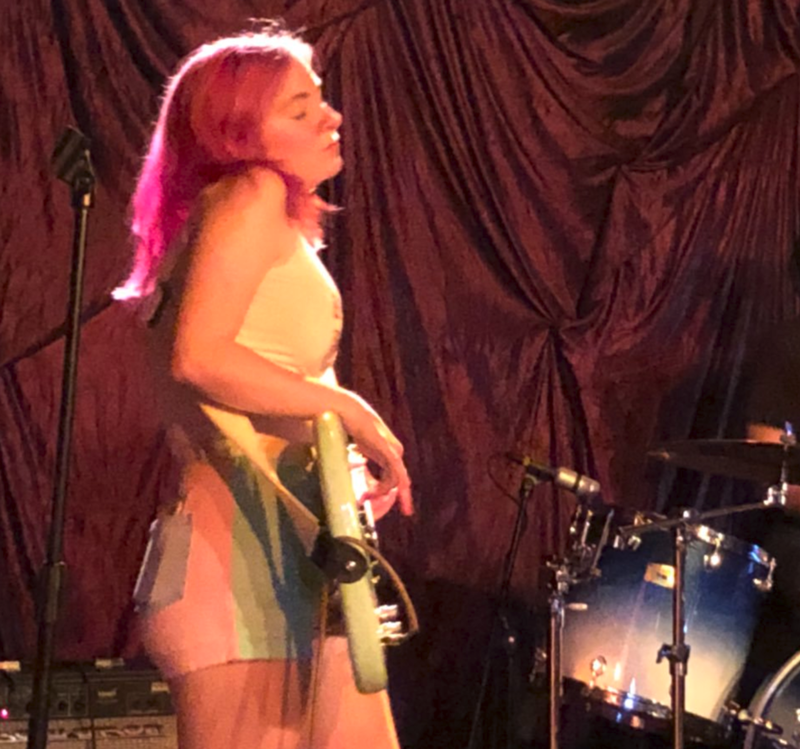 "I was brought up by Lilith Fair to believe that men and women enjoy live music equally and that women can not only headline a festival—they can BE a festival. I’m proud to announce that our festival has an ALL female-fronted lineup,” Carlile said in a statement. “I would absolutely LOVE to see a ton of men there supporting women in rock and roll, I want to see mothers with children, single people, LGBTQ brothers and sisters letting it all go for a weekend together in harmony (with bottomless tequila on hand to assist)." Tickets went on sale TODAY! Get them here before they're gone! If you follow The Secret Sisters on Instagram, you may have recently witnessed their passion for equal representation, specifically, among women and people of color. Laura and Lydia were in the Nashville airport when they noticed a C.F. Martin & Co display that showcased a number of significant musicians playing a Martin guitar. However, every picture was of a white male... The music industry and a plethora of others are failing to keep equality and proper representation in mind even with something as simple as the photographs in the airport. On the other hand, The Secret Sisters are playing in another festival with a lineup that proves some people are aware of the problem. In September, the ladies will be playing at the sold out Moon River Music Festival in Chattanooga, TN that has quite the diverse lineup! Hopefully, by now you are aware of the issue and will demand better! We need festivals to be conscious and deliberate about the artists they ask to perform. Of course, equality is an issue in a multitude of industries but, let this inspire you to support females in every facet of art and life! Support women by going to their incredible concerts, buying their photography prints, reading their books, and everything in between. Her song "Free" will be performed by Hayden Panettiere in the final episode tonight. Click here to listen to her version of "Free" that was released on her album The War Inside in 2015. 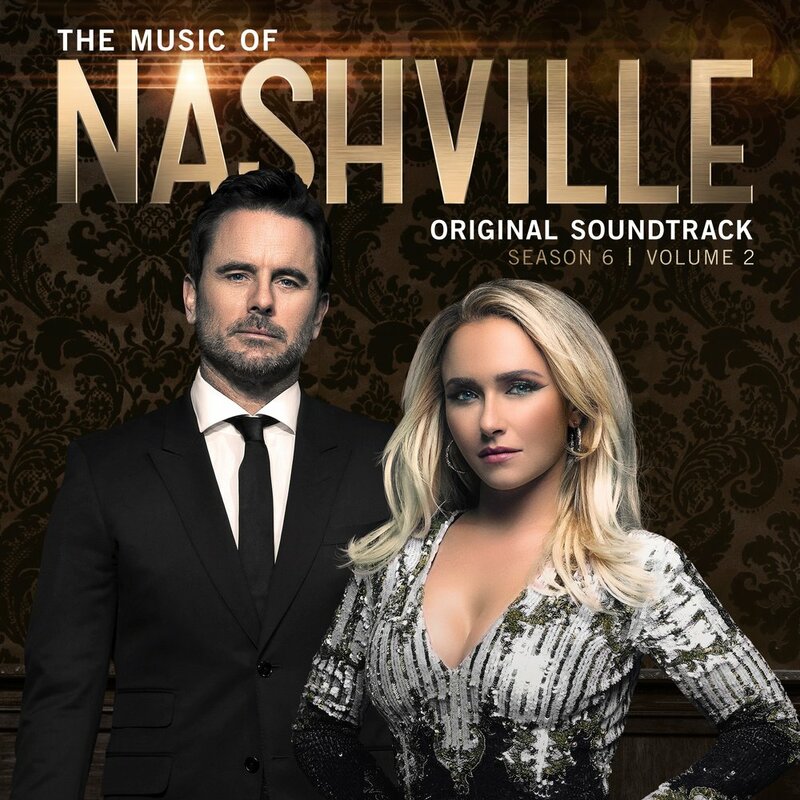 The Music of Nashville, Season 6 Volume 2 is set for release on July 27. This soundtracks includes three song Jill co-wrote! Check out the full list of songs at the link below! *Pro Tip: If you go to Spotify's desktop app to listen to the playlist, you can right click on each song and see the songwriter and producer credits! Use this feature to find all of Jill Andrew's material! Read more about this Spotify update at the link below! The new Hush Kids track "Love Is a Made Up Word" echoes with soft piano, deep guitar and brilliant harmonies from the incredibly talented Jill Andrews and Peter Groenwald. It's been a very successful first couple of weeks since the release of their first single. The song currently has 45,300 streams on Spotify and can be found in Spotify's "Acoustic Love" and "Fresh Folk" playlists and in Amazon Music's "Fresh Folk & Americana" playlist! The lyrics of the song really stood out to me when I first heard it because of how beautiful the verses and choruses were phrased. The description of someone's pulse quickening and the sensation of being lighter illustrates the very genuine and organic feelings associated with the emotion of love. The emphasis, however, is not on the word "love" it is on these exciting instincts that are felt yet cannot be defined. I think that's why the song becomes so much more powerful. The rawness of the lyrics depicts sensations that cannot be bought or exchanged through material things. It is more of an authentic feeling that's ignited because of another person. I love this modern-day ballad and believe it is a refreshing step into the Folk and Americana genres. In honor of its exciting start in the listening world and altogether exquisite musical composition, here is a clip of of the acoustic version of the song. We hope you enjoy this version as much as the original! The Secret Sisters Songs Can Now Be Added To Your IG Story! Instagram has recently announced its newest feature of adding music to Instagram stories, and The Secret Sisters is one of the many artists included! With a library containing thousands of songs in several genres, users are now able to incorporate their favorite songs into shared moments on their Instagram stories. Facebook has established agreements with major record labels and music publishing companies in the past months to ensure that user-generated content is safe from being deleted due to use of unlicensed music. The goal of Facebook and Facebook-owned companies like Instagram, Facebook Messenger, and Oculus, is to foster creativity among its users so they are able to share their work on these social media platforms. After solidifying the deals with the music companies, Facebook is encouraging its users to utilize this creative and fun feature across their social media platforms as much as possible! What's even more exciting is The Secret Sisters’ second album Put Your Needle Down is included in Instagram's library so you can add their music to your next Instagram story! All songs are 15-second clips, but users are able to select the part of the song they want to include. Below is a quick and easy guide on how to add The Secret Sisters to your next Instagram story and make your content even better! Tap to add a sticker to your photo or video, and you will now see a music icon in the middle of the different options. When you tap on the music icon, Instagram's vast library of songs will pop up and you can swipe to look through the genres, moods, or by searching in what's popular. Search "The Secret Sisters" and the entire Put Your Needle Down album will show up. Select which song you want to play during your story and you're all set! 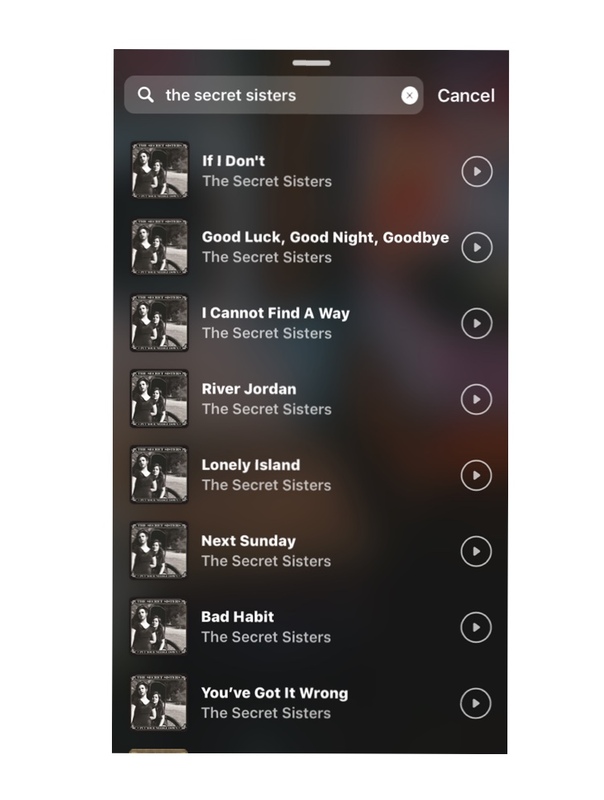 By searching for The Secret Sisters, you are able to select any of the songs to put on your story! Get creative and add The Secret Sisters music to your story!! When you've added a song from Put Your Needle Down, all your followers will be able to view the song and artist you've chosen in a sticker format on your story! Your followers can now see and hear what you're listening to and become fans too!